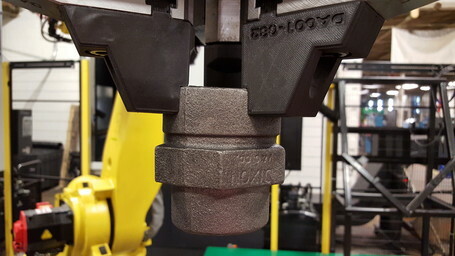 Dixon Valve prints jaws that mount on a robot that transfers fittings between machining centers. They must survive corrosive fluids while subjected to repeated clamping forces. Markforged enabled Dixon Valve to produce new manufacturing tooling solutions faster and cheaper than ever before. System Engineer J.R. Everett describes the Mark Two as “a critical component in our design process [that’s] really changing the way we work to the point where we are actually altering our procedures and plans to accommodate it.” With their machines, Dixon Valve engineers eliminated the need to outsource or machine in house the vast majority of their grippers.